The name given to these gentle giants of the ocean has rather shameful origins. The right whale was so named by whalers who considered them the "right" whale to hunt due to their docile nature, their plentiful oil and the amounts of baleen they can provide. These majestic creatures are also known as the black whale. There are three species of black whale:: the North Atlantic right whale (E. glacialis), the North Pacific right whale (E. japonica) and the Southern right whale (E. australis). On average, these whales grow up to 18 metres long, making them larger than humpbacks and grays, but smaller than the mighty blue whale. Black whales have a tendency to swim close to coastlines where the water is warmer and food sources more abundant. Indeed, black whales can sometimes be seen from the coast, frolicking in the offshore waters. 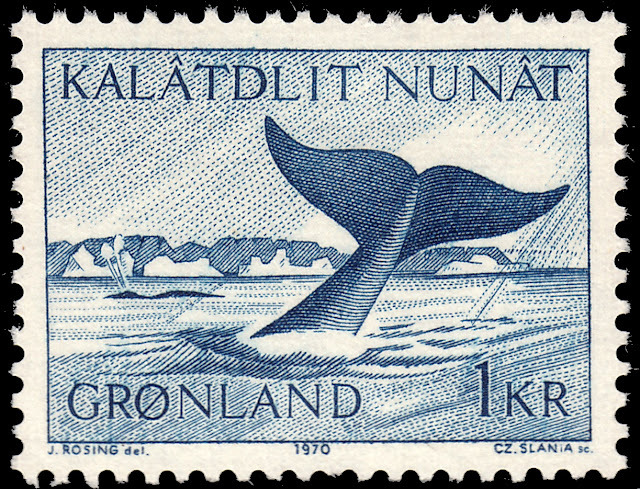 On 5 March 1970 Greenland issued a stamp featuring the great tail of a black whale off the coast of the island of Disko Island. This stamp was designed by J. Rosing and engraved by Czeslaw Slania. Again this designer engraver combo has created a fantastic stamp, crammed with visual appeal. In the foreground we see the glorious tail of a black whale diving, perhaps for another feed. In the background to the middle left we can see a second black whale coming up for air, shooting a geyser of water from its distinct V-shaped blowhole. And dominating the horizon in the background is Disko Island. Perhaps there are some spectators on those cliffs watching the spectacle with fascinated wonder. A small group of high ranking German officers stood in the well-lit war room, all focused intently on the map laid out before them. One of the officers leaned forward and placed a marker over the country of Denmark. There was a murmur of assent among the officers. The decision to invade Denmark had been made. The date was 17 December 1939. The above is, of course, pure fiction. But a similar scenario may have taken place in Berlin on 17 December 1939 when the Germans decided to invade and occupy Denmark. Then on 9 April 1940 Operation Weserübung was launched, and Denmark became a de facto protectorate of Germany. But it wasn't until 29 August 1943 - some three and a half years later - that Germany placed Denmark under direct military occupation. Aside from being under the thumb of an invading force, most Danish institutions continued to function in a similar manner as before - for a while, at least. The Danish government and the king remained in the country in an uneasy co-existence with the Germans. But when the Germans demanded a sentence of the death penalty for those found guilty of sabotage, the Danish government stepped down in protest. Despite the fact that the German occupation of Denmark was relatively civil in comparison to other areas of occupation, over 3,000 Danes died during this time. Denmark remained under German control until the Allied victory om 5 May 1945. Celebrations on the streets of Denmark and Greenland ensued. 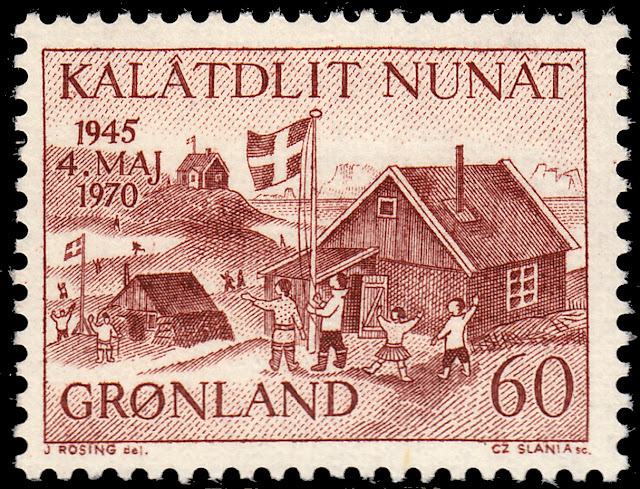 On 4 May 1970 Greenland issued a lovely stamp to celebrate the 25th anniversary of the liberation of Denmark from German occupation. 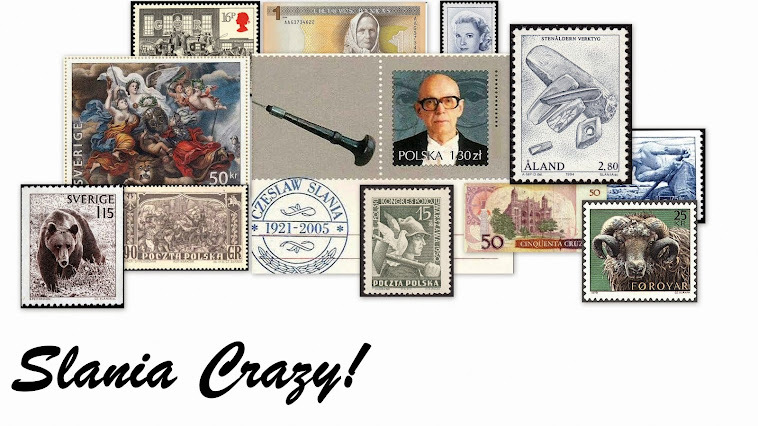 To create this stamp, master engraver Czeslaw Slania again teamed up with designer J. Rosing. This stamp depicts a moment of celebration on the streets of the Greenlandic town of Ilulissat (Danish: Jakobshavn). You will note that yet again, the artwork n this design is playful with a hint of childish cartoon-like simplicity. They roam across the rolling plains of Greenland and the arctic regions of Canada, often in herds of eight to twenty. They have long, thick coats and short, but vicious horns. In the mating season, males emit a strong, musky odour to attract females. They are the Greenlandic muskoxen, known to Canadian natives as the "bearded ones". During the Pleistocene period 2,588,000-11,700 years ago, muskoxen were much more widespread. Fossil evidence reveals that they inhabited much of the Siberian and North American Arctic, from the Urals to Greenland. However the Quaternary extinction event during the transition from the Pleistocene to the Holocene (13,000 BCE to 8,000 BCE) saw the populations of muskoxen in the Americas wiped out. Over time, hunting has also further reduced the number of these majestic creatures. Indeed, today populations of muskoxen mostly live in areas where they are, thankfully, protected from hunting. 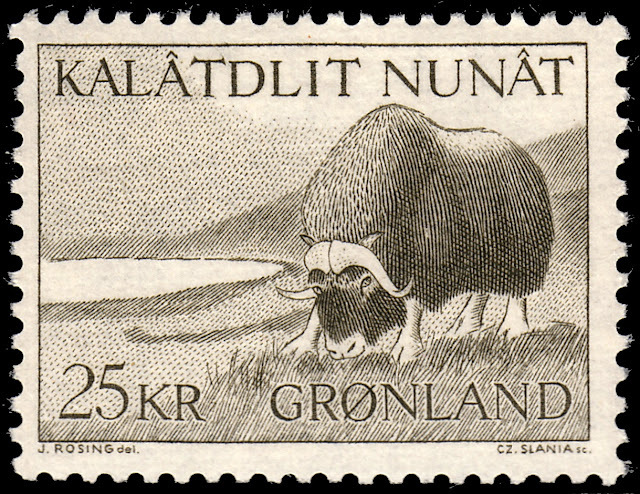 On 27 November 1969 Greenland issued the first stamps in a series of five depicting various native fauna. Issued on this day was the 25kr value, depicting a muskox grazing in the fields. The stamp was engraved by Czeslaw Slania and it was designed by J. Rosing, an artist with whom Slania had previously collaborated for the Greenland postal services on many occasions. Indeed, together they had already created some of Greenland's most iconic stamps. This design, almost cartoon-like in style, manages to capture the wild, yet calm, nature of this amazing arctic creature. Simple. Elegant. A Slania classic! The goal of the storyteller has always been to captivate the minds of his audience, enabling them to transcend the rigors of everyday life and, for a time at least, exist in a magical world. The goal of the teller of fairy tales in Greenland includes a slight twist to the norm - to put his audience to sleep! In fact, the best story tellers would commence their narrative with a line such as, "no one has ever heard this story to the end." This idea seems counter-productive, but the primary aim of the Greenlandic storyteller was to help people survive through the long, cold winter nights. And what better way to survive then to be snuggled up by the fire, asleep. The fairy tales of Greenland cover a wide and varied range of topics. Indeed, over the last few weeks ago I have been studying with captive wonder stamps engraved by Czeslaw Slania, featuring fairy tales from Greenland, such as The Boy and the Fox and The Great Northern Diver and the Raven. This week's fairy tale is titled The Girl and the Eagle. These stories have in all likelihood survived the sands of time through countless word-of-mouth re-tellings. This can make tracking down the content of the tales extremely difficult to find. So far I'm 0 for 2 on sourcing these stories. Unfortunately, try as I might, I have again not been able to find anything on this fairy tale. So, sadly, I'm 0 for 3. Perhaps the story may have some similarities to the 2016 film The Eagle Huntress , a story about a 13 year old Mongolian girl who is fighting to become a hunter using an eagle, an Eagle Hunter. This is a domain solely for men, but this girl decides she wants to change this. She wants to be the first Eagle Huntress! But then again, maybe the stories are completely unrelated and I'm just a raving loony! 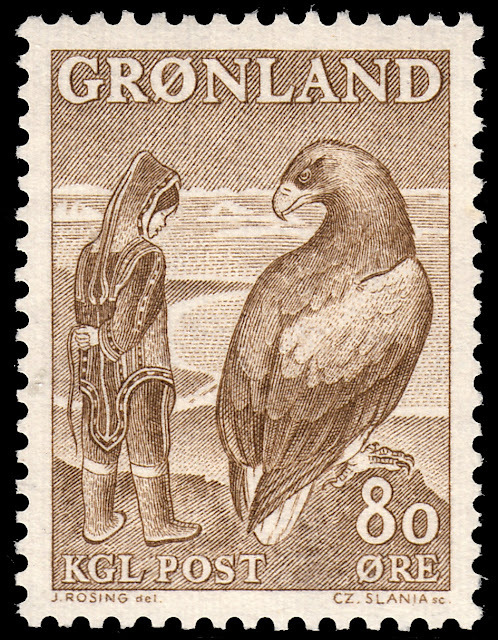 On 18 September 1969, Greenland issued the fifth stamp in its fairy tales series. This stamp, along with the two other stamps mentioned above, was engraved by Czeslaw Slania and designed by J. Rosing. As we have come to expect from Slania, this stamp is truly gorgeous. The eagle is a masterpiece in and of itself. Just look at those feathers! Wonderful.